You know you’re living your halcyon days when you get to pussyfoot into Walter Van Beirendonck’s final fittings to pick up invites at 8PM on a Parisian Tuesday. Walter is slipping a gorgeous camel jacket with large side ruching and animal shape applications on the tallest drink of water you’ve ever seen. A fine gilded chain with charms is draped on the model’s face, and he stomps to and fro on his shoes with well-pronounced heels. Discerning eye squints and cocked heads from Team WALTER. Incredulous side glances and stifled WHAT-IS-LIFE’s from Team KNOTORYUS. 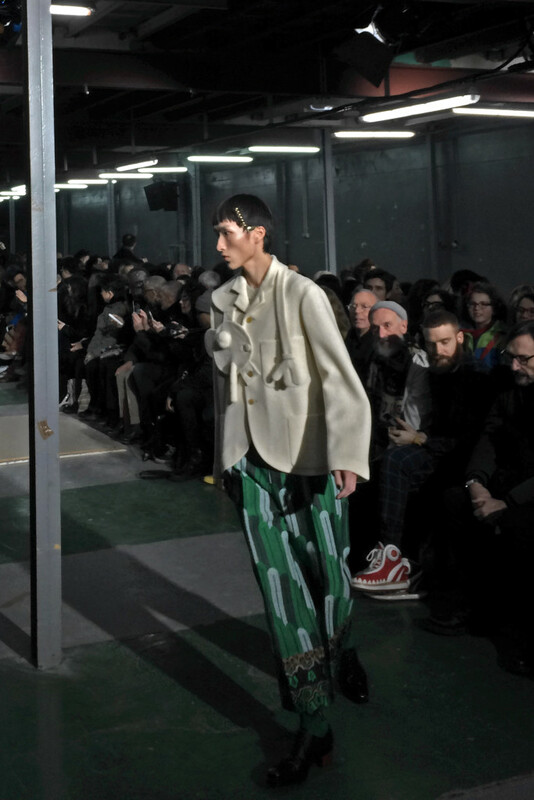 For AW16, Antwerp Six legend Walter Van Beirendonck didn’t blunt his blade cutting through society’s nonsense by any measure. The show invite poster – currently on its way to the closest framer I can track down – featured a slew of cheetah amputees, gaping wounds in the earth’s soil, phallic artillery and broken iMessage bubbles, illustrated by the talented Brecht Vandenbroucke. Walter is WOEST and he’s about to pinpoint exactly where you have him messed up. 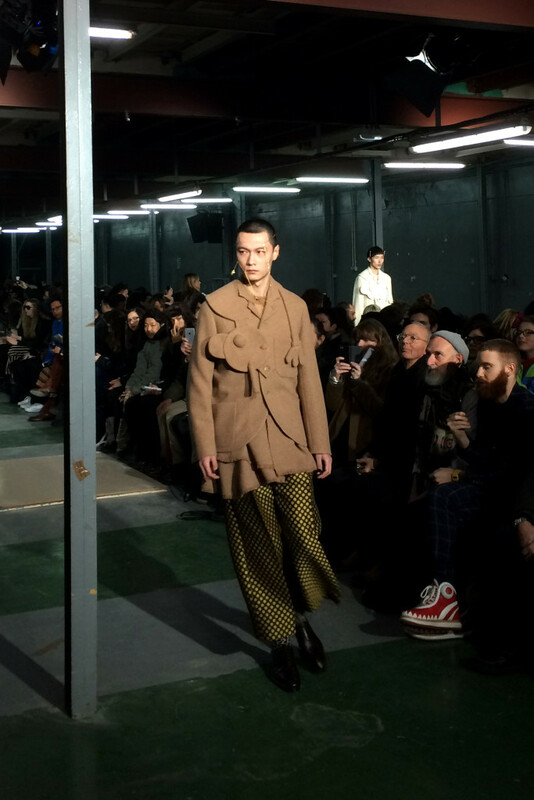 The show venue, a graffiti-emblazoned Parisian depot with moss seemingly haphazardly stuck to the entrance walls, offered a literally chilling backdrop to the colourwork about to come. Security guards wielding metal detectors bleeped away, as I flushingly dug up the iPhone charger culprit from my jacket pocket. Does this count as attending an underground rave? Thumping, droning sounds bleated from the speakers and the models emerged. Like hunters carrying home their hard-won game, animalistic shapes were masterfully draped over coat shoulders. Weapon-like applications popped out on coats in the brightest shades of red, green and custard. Leopard print motifs pounced from ankle-skimming trousers, socks, long coats, dress shirts and tabards. Indigo denim boiler suits shimmered with jungle creature paneling. Nail polish was applied in tune with bright socks and raised heel lace-ups. “Stop Terrorizing Our World”, a recently much-shared message from the AW15 show, popped up again on a clear-front jumper. Walter is angry at the perilous world we find ourselves in, but gravity of the message aside, you would be mistaken to have expected a morose, colourless collection. Although that black bomber look would do perfectly travelling to a Weltschmertz-induced secluded getaway. Finally, the beard to rule them all took his bow; leaping wildly as he ran through the venue, snarling in a ‘WOEST’ sweatshirt and orange beanie. Complimentary fangirl bat screeching, courtesy of us, can be enjoyed in the video below. At the very end, the bass beats checked out and an instrumental version of David Bowie’s “Life On Mars” trickled in; a sweet tribute from one icon to his own. We can always try to make it work up on the Red Planet, Walter. I’ll bring the nail polish! How amazing is the make-up by Inge Grognard & hair by Charlie Le Mindu ? !